Sometimes you often wonder how many times travelers and locals for that “right” place to for dinner in South Beach. While some have their plans mapped our days or hours in advance, now you have the arrival of Doa and their combination of Latin and Asian flare that is right on the money with location and time for you to enjoy their dining options, open to 5am every day. Arjun Waney, the restaurateur behind Miami hot spots Zuma and Coya, revealed his latest project, Doa (pronounced dow-ah) just three weeks ago. Once you walk into this mecca of a restaurant, you will see why this is going to become a go to spot on the beach unlike the other concepts that have just faded into the Miami nights. 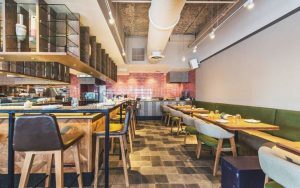 Bringing together predominantly Peruvian fare with heavy Japanese, Chinese, and other pan-Asian influences, Waney’s new restaurant, located at 2000 Collins Ave., will add a whole new layer to Miami’s love affair with Peruvian cuisine and all things umami. It’s location is right in the mix of nice places like the W South Beach and directly across the street from the Setai Hotel. One of the things our staff really liked is how much space this restaurant has both inside and on the patio. They created a space where open cooking takes place and floor to ceiling windows make the experience inviting for everyone dining at all hours. The patio and its deep couches make you feel like you are relaxing in your back yard and looking inside of the dining area complete with two separate bar areas, is Miami at its best. People watching and good food, its all right here. If you like drinks, this is your place. Their beverage program is inspired by Latin and Asian spirits. The cocktail menu was developed in part by James Shearer, global group beverage director for Zuma, Roka, and Oblix. 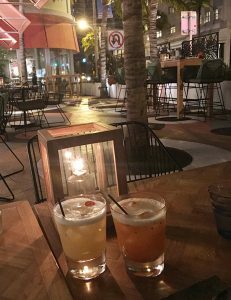 While Peruvian classics such as the pisco sour and the chilcano will play front and center on the menu, signature drinks like the Nikkeispritz, Cuzco 75, Doa lychee martini, and an apple and shiso mojito will give South Beach nightlife a run for its money. The menu has some very unique asian and latin flare that included the must have Chicken and Beef Skewers their blend of spices make this one of the best options to share. We had to order two of each they were so tender and packed with Aji Amarillo and Aji Panca made these the first choice on the menu. 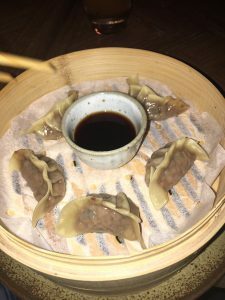 Other items that can’t be missed are the Beef Goyza from their Dim Sum Menu and the Soft Shell Buns, or in our eyes one great roll of fresh goodness. Six styles of Maki Rolls are available with the DOA Ceviche Roll being the preferred favorite so far as it pops with the fish of the day and a close second is the Yellowfin Tuna from the Nigiri part of the menu. The best thing about all of this goodness is it is amazingly affordable for the quality of product they are putting on the table. Tons of great grilled and hot pot options should be considered as well. Their pork belly and 8oz Spiced Tenderloin served Szechuan style makes this the beef of choice. The best thing about DOA if you miss their hours, probably hard to do, they offer many of these items as brunch options on Saturday and Sunday.